Alongside the rush of brave independent concepts opening over the last few years, it seems as though local diners have munched full circle back to franchise restaurants. If the ’90s and early naughts were marked by long waits around Swensen’s, Jack's Place and Seoul Garden, 2015 and 2016 are seeing hot holiday pilgrimages set up church in Singapore. 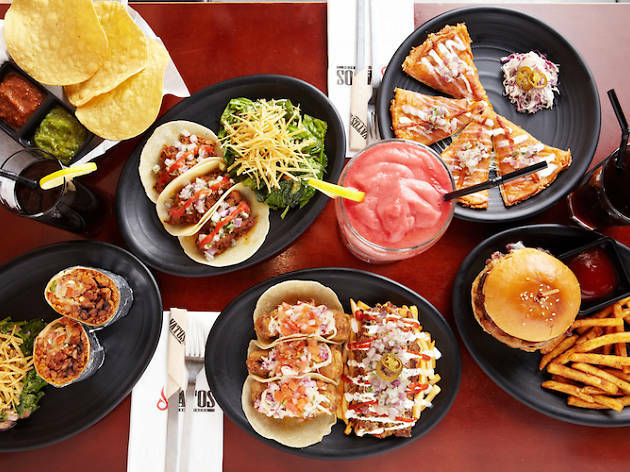 Driving a part of this resurgence is Vatos Urban Tacos, the first international outpost of the Seoul Ko-Mex chain, brought to Singapore via club kids Massive Collective. The brainchild of Korean-Americans Sid Kim, Jonathan Juweon Kim and Kenny Park brings together tasty ganjang- and ssamjang-marinated meats with messy Mexican fare – it even served as a diplomatic stop on John Kerry’s tour to the South Korean capital. And that Kim has decamped here to align this outlet with his seven back home is surely an encouraging sign. A quick glance through Vatos' menu and you begin to see where some Seoul-emulating restaurants in Singapore borrow their kimchi-bending inspirations. It's hardly groundbreaking alchemy: tacos are usually a simple balance of inexpensive cuts, veg and citrus. But even then, Vatos excels. The shells here are less rugged cornmeal circles and more smooth, springy wraps that resemble gujeolpan or popiah skins. Any quibble on their merits is quashed at first bite. Clean-chewing beef galbi short rib ($12/two, $17/three) is an exploding flavour piñata of heat, sharp onion pickles and garlicky meat. Baja-style battered fish tacos ($10/two, $14/three) are a complete package of hammy chipotle spice, mild meat and tart apple coleslaw. And it's easy to see how the cheesy Tex-Mex-style chimichurri-topped chicken ($10/two, $14/three) earned Vatos' Korean staffer Flora Lee props in a company-wide cook-off. Bulgogi-seasoned pork belly ($10/two, $14/three) is the only let-down, with meat that’s too salty and sinewy. Sides and starters also make good of the marriage. Those kimchi and pulled pork shreds heaped on shoestrings ($16) are addictive, and the spicy queso of pepper jack and cheddar ($15) served with crunchy corn nachos, though too salty on our visit, stays gooey for longer thanks to its mini-stone bowl. Sitting in the darkened, red-bricked room swigging a margarita with a bottle of beer teetered over it ($28-$29) or a mason jar of fruity, slushie makgeolli-margarita hybrids ($25), you won't think of coming for lunch. You should. The meal-in-one burrito bowls are like guacamole-crowned bibimbaps, but, if you’re not a fan of rabbit food, the steak and lime-spiked prawns in the Surf ‘N’ Turf ($23) will more than suffice. With restaurants like Chicken Up, SYNC Korean Fusion Bistro and Don't Tell Mama, Vatos is by no means as novel here as it was when it launched in South Korea back in 2011. 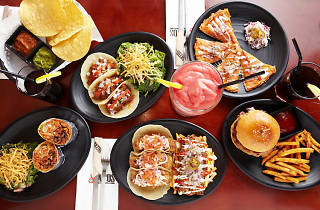 Still, the loud fun of going elbows deep into full and brightly flavoured Ko-Mex creations, helped on by the boozy drinks, swirls into a good night out – even if its neighbourhood hasn't yet gotten the memo.